Here’s an odd little script of mine: FAMOUS PEOPLE KILLED BY ANIMALS. It’s an one-act about a suburban costume party in which each person comes dressed as, well, um, a famous person killed by an animal. * Cleopatra, the Egyptian queen and the host of the party. * Jezebel, the Biblical harlot queen. * Gallito, a famous Spanish bullfighter and the husband of Jezebel at this party. * Aeschylus, the Greek playwright and the husband of Cleopatra at this party. He finds the whole thing ridiculous; he just wants to sit and watch football on TV. Oh, yeah, bad things happen. You can find the full gallery of photos here. Two of my short plays had staged readings in Los Angeles last month, I learned today. The Readers Repertory Theatre at San Pedro (a neighborhood of LA) featured a reading of the one-act THE RING and the five-minute script CAT ON TRIAL on Feb. 25 at the Croatian Cultural Center of Los Angeles. Sixty years after a close call in a state championship girls basketball game, the star of the losing team still can’t reconcile herself to losing — so she breaks into the home of the star player on the winning team, hoping to steal her championship ring. A poignant story about regrets and sportsmanship. Cast: Two senior females. •	Staged reading at Readers Theatre of San Pedro, (Los Angeles), February 2015. A retiree puts the neighbor’s cat on trial because it caught a bird. Two versions available. Cast: Two seniors — one male, one female. * March 25-27: Production of HAMLET GOES HOLLYWOOD, High Meadows School, Roswell, Georgia. * May 1: THE MONKEY AT THE WEDDING, Acton-Acton-Boxborough Regional High School, Acton, Massachusetts. I’m a pack rat, so I always ask theatres that perform my work to send me posters, programs, photos, and what not if they can. 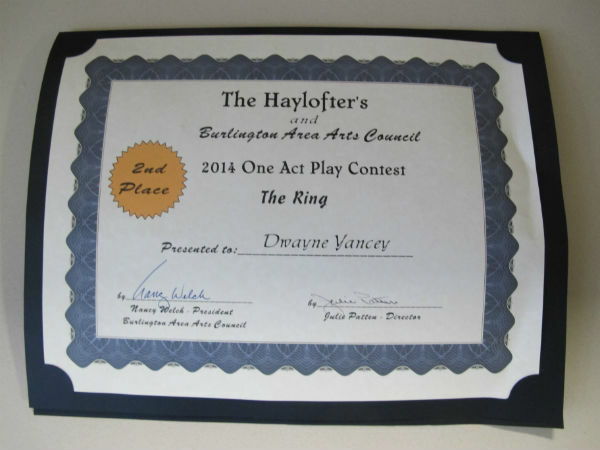 When The Haylofters in Burlington, Wisconsin recently performed my one-act, THE RING, I didn’t have to ask. Since this was a competition, the theatre mailed me my certificate. As previously noted, THE RING took second place in the audience vote. What I didn’t realize until I read the program was there had been 260 entries. Second place out of 260? I’ll take that! And I’d be remiss if I didn’t point out that THE RING, like all my unpublished work, is available royalty-free. I explain why here. A few weeks ago, I departed from my usual rule, which is to never pay to enter a contest. However, I had a script which I thought was a sure winner for the New Voices Play Festival, an annual new works contest put on by the Old Opera House Theatre in Charles Town, West Virginia. That script was “The Ring,” a sad little one-act about an elderly woman who breaks into the home of another elderly woman to steal her state championship ring, won many years back in a high school basketball game. I was also motivated by the fact that a few years ago, I had a staged reading in the same festival of my one-act, “Larry’s New Guardian Angel.” Also, it’s the town where my maternal grandparents once lived, and now are buried. The rules allowed for two submissions, so I also packed off “Follow the Money: A Modern Day Fairy Tale,” a cute little take on where the tooth fairy’s money comes from. That’s a script I’ve also been proud of, and entered elsewhere, but to no avail. This week, I was informed that . . . low, “Follow the Money” had been accepted and will be one of four scripts produced June 21-23, with the audience voting on their favorites. A precocious youth attempts to find the secret to the tooth fairy — by kidnapping her. Where do all those teeth come from? And the money? Cast: Six — two female, four male. Running time: Fifteen minutes. The Christmas one-act “The Fruitcake” — published by Brooklyn Publishers — is pulling away as my most frequently produced work. Two places have produced it this winter season, and one more is scheduled to. * Cedar Rapids Public School, Cedar Rapids, Nebraska, Nov. 19, 2012. * Rock’n’Bach (which appears to be a private arts school of some sort), Frisco, Texas, Nov. 30, 2012. That Rock’n’Bach performance marked the 35th production. Alas, for all those productions, I have yet to see a one, nor receive any photos from any of them. My second most frequently-produced script is the one-act “Macbeth Goes Hollywood” — produced by Eldridge Plays and Musicals. That show has been produced 24 times, most recently in October at a school in Steger, Illinois. In third place is “Hamlet on Spring Break” — published by Playscripts. That show has been produced 23 times, most recently in July 2012 by a school in Port Republic, New Jersey. (Here’s video from a May 2007 production in Winston-Salem, North Carolina and still photos from a 2004 production in St. Paul, Minnesota. However, that ranking might change. In fourth place is another Christmas show, “Santa Claustrophobia,” through Big Dog Plays. It’s been produced 17 times. However, Playscripts notifies me immediately when a production is scheduled; Big Dog only lets me know when it’s time to send a royalty check. Last year, “Santa Claustrophobia” was produced three times, so it’s possible there are more productions out there this fall, which could cause Santa to bump Hamlet back to fourth. In fifth place is “Code 40 Verona,” a murder mystery based on the police investigation into the deaths of Romeo and Juliet. It’s published through Eldridge, and was last produced in October 2011 at a school in McDonough, Georgia. I have other published scripts that have been produced less frequently and, of course, I have many unpublished ones, which are available, royalty-free, through me. Inquire within! Almost all run about 25-30 minutes; designed to fit within the time limits of most one-act contests. A few run longer, a few run shorter, as noted. All can be produced with minimal staging. All are available directly from me, except those that have been published, which are noted — and are available from their respective publishers. Here’s a list of my one-acts that I’d deem suitable for high schools and community theatres. Almost all run about 25-30 minutes; designed to fit within the time limits of most one-act contests.